BERKELEY TOWNSHIP, N.J. -- New Jersey homeowners have been fighting Gov. Chris Christie's plan to build protective sand dunes since he announced the effort months after Superstorm Sandy. They've lost at almost every turn. But five years after the storm, the latest challenge brought by homeowners objecting to the state's intention to seize privately owned land for the dune and beach widening project might have the best chance of succeeding out of the half-dozen that have gone before judges, thus far. A condominium association in Berkeley Township, just south of Seaside Heights, where the notorious MTV reality series "Jersey Shore" was filmed, is fighting New Jersey's attempt to seize part of their privately owned beach for the dune project. What makes this case unusual is the size of the dune that's already there, which was built, paid for and maintained by the homeowners. The 25-foot-tall dune, which is several decades old and bolstered each year by discarded Christmas trees that trap sand and add to the dune structure, is taller than what the U.S. Army Corps of Engineers plans to build there. It effectively protected the 386 small houses behind it during Sandy. "Where's the common sense?" asked Dominick Solazzo, president of the Midway Beach Condominium Association that owns the beach. "It's just crazy. How are you going to give us something that's less than what we already have and tell us it's going to be better?" The case is to be heard Friday in state Superior Court by the same judge that has ruled against dune objectors on two previous occasions, ruling that the state has the right to proceed with land condemnations for the project. A coastal storm on Sunday, the fifth anniversary of Sandy, caused some erosion in the area but left the dune largely intact. The state Department of Environmental Protection said Sunday's storm did not appear to cause significant erosion along the shore. Anthony DellaPelle is the attorney for the Midway Beach condo association. He previously represented homeowners objecting to the dune project in Bay Head, where they claimed that the privately built and maintained rock wall offered the same or better protection than the state and federal project, and in Point Pleasant Beach, where homeowners included the Republican governor's brother, Todd Christie. In both cases, Judge Marlene Lynch Ford ruled in favor of the state. But DellaPelle says that this case is a clear example of trying to fix a problem that doesn't exist. "They have a dune system which the government concedes is better, and if the (condemnation) proceeds, they will not be able to maintain it, so that it will result in less protection," he said. He and members of the condo association also wonder whether officials will actually lower the height of the existing dunes to conform with specifications of the planned project, or whether they would allow what is in place to remain as is. A spokesman for the state Attorney General's Office declined comment. Steven Rochette, a spokesman for the Army Corps, said the agency probably would leave the dune height unchanged and add width around or in front of it. But the state's property assessment notes that homeowners' views might actually be improved by reducing the height of the dunes from the 25 feet that is there now to the 22 feet called for under the project. Previously, at least six lawsuits trying to block the project either failed or remain bogged down in settlement talks. Homeowners in Margate, just south of Atlantic City, lost a federal court lawsuit against the dunes, then sued in state court this summer after the new sand piles caused massive flooding on many of the city's beaches. The state and Margate recently agreed to a system of outfall pipes carrying storm water out to the ocean. Bay Head homeowners' insistence that their rock wall provided the same level of protection or better than the state's dune project was rejected, as was a case from homeowners in Point Pleasant Beach, a group that included the governor's brother, who said he did not support the court challenge. 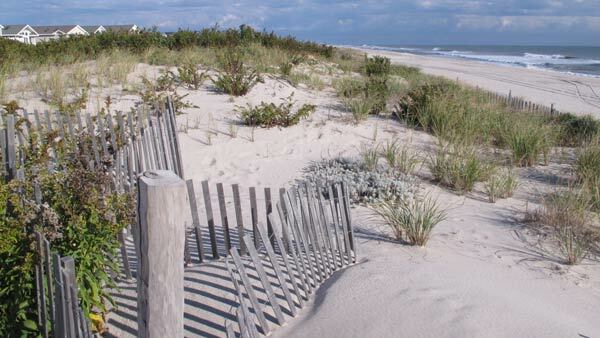 A landmark case on Long Beach Island led to a Harvey Cedars couple accepting a $1 award after the state Supreme Court ruled that courts must also consider the financial benefits of storm protection in addition to the detriment of lost ocean views in deciding dune cases. And the popular Jenkinson's beach in Point Pleasant Beach has been in settlement talks with state and federal officials for two years in their lawsuit against the dunes.